Hello friends. Now I will tell you about the technology of warming the foundation. Before warming it is necessary to prepare a site for gluing the insulation. Step 2: Remove the Ground. Originally removed the ground. For easy operation. Step 3: Stick the Foam. Glue the foam on the site for insulation. Glue the insulation with special glue. Glue was applied first to the foam. Then he put it on the wall. Step 4: Heat Insulation Treatment. The foam should be fixed with special nails. And the remaining hole foam foam. After that, straighten the curves of the joints of the foam. Step 5: Plaster of Foam Plastic. Angles. On the side of the foam I will glue a special reinforcing mesh. First on the plaster sidewalls to make neat angles. Reinforcing mesh will give strength. Step 6: Bonding the Reinforcing Mesh to the Foam. After I finished processing the corners of the foam. I proceed to gluing the mesh on a flat surface of the heater. This is the easiest part of the job. After the glue has dried well. The lower part of the foundation must be treated with bitumen mastic, which would not get moisture. Step 8: Result. Made by Own Hands. The result was the same. The foundation is warmed and processed with mastic. Hi! Yeah, it necessary to insulate these old type homes. I have a few things to recommend for the next time. First, always avoid from salient/shoulder. It is recommended and also enough to use thinner panels at the ground level. This kind of built strategy can repel the water. It is also warmly recommended to use a starter metal profile to avoid the penetration of the mice. They can make very big damage under the coat. Finally, the white type of styrofoam has open cells so it can pick up some water. 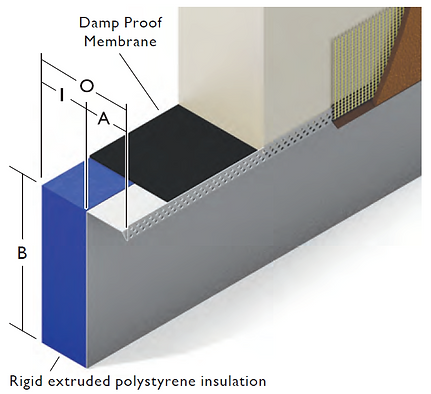 recommended using a closed cell type rigid extruded polystyrene. Usually, they are colored (pink, blue or green) depending on the quality and the producer. Thanks for the advice. At me the limited means, and I do warming in the most deshovym way. And so there are plans in the future to add a metal stand. I have done temperature measurements at various depths underground. I have found that the temperature underground is about 60F. This is WARMTH. If your outer foundation is exposed to the cold air, then the brick foundation could be 10 or 20 degrees F. If the styrofoam is placed on the wall... PLUS extends underground a foot or 2... then the 60F heat underground helps to "warm up" the wall a little bit. I like your idea and I think it would help keep the home warmer and I suggest you extend the styrofoam a foot or 2 below ground. Otherwise, the COLD temperatures are still getting into the wall at the ground level. Then pile up dirt against the wall as high as you can will help also. I have plans, in the future, to finish the rest of the whole part to the ground. The budget was limited, and bought only a limited amount of foam. And it was decided to warm the strip. Couple questions. First WHY? Do you live in a cold climate that needs this done to a house to make it livable? Second question, did you notice any change in inside temperatures, and/or a reduction in energy used? I am in Ukraine, the house was built during the USSR in 1985, at that time the heat was not saved, and houses were not insulated. Before warming: in winter, the average temperature was 18-20 °C (64-68 °F). After warming: Average temperature in winter 24-26°C (75-78 °F).